You are currently browsing the category archive for the ‘food bank’ category. First trip to the food bank in who knows how long, but early chard is finally ready, having survived massive slug predation, a bad leaf miner infestation, one week of scorching heat, and otherwise thoroughly terrible growing conditions. Chard and other hardy greens are the main focus in the food bank beds this year, so hopefully these will keep producing into fall, maybe even next spring if we’re lucky. The food bank beds at our pea patch are nourished by many folks from both within and without, who give time practically year-round to keep things up. Thanks to herb starts from Lettuce Link, a local nonprofit supporting food bank gardeners, we already have some basil to give. We’ll donate a few carrots planted some months ago by a preschool down the street, and having a spare moment on my hands yesterday afternoon, I culled a giant fistful of wild mint from the weedy hillside. All in all not such a bad first delivery, except for how late it is already in the year. Short of an Indian summer we won’t likely make up for it with an end-of-season windfall. Still, being able to share garden abundance with others is definitely part and parcel of what makes summer feel like summer. While contemplating this year’s seed catalogs, consider ordering an extra seed packet to grow for your local food bank. 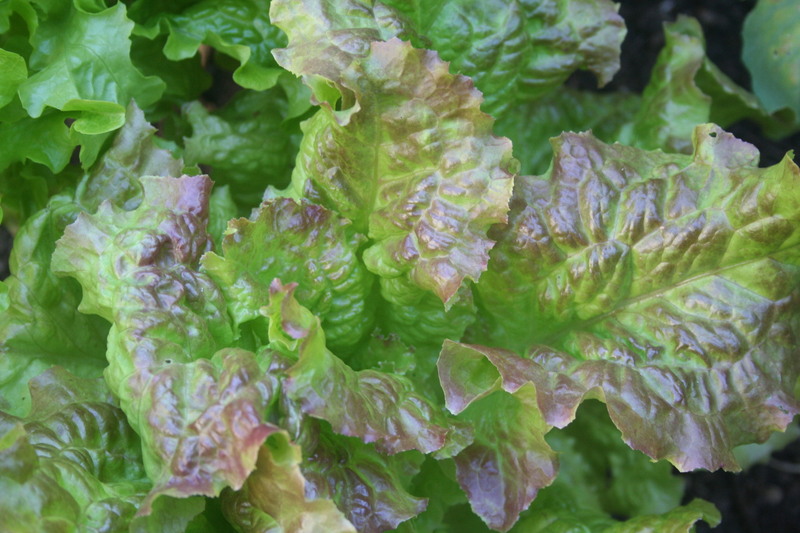 Lettuce Link recommends choosing a productive crop that can be harvested in batches, which makes things simpler for you in the garden, easier for food banks to distribute, and better menu planning for meals-on-wheels programs. 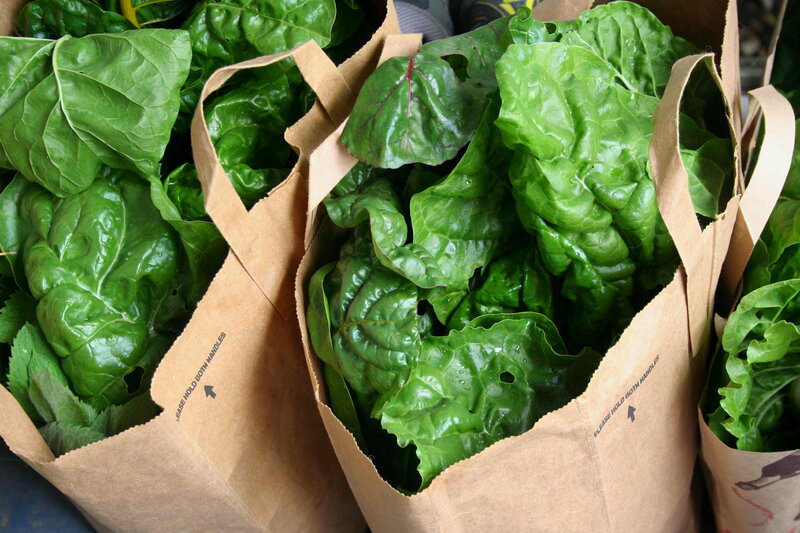 I like low maintenance greens such as chard, kale, collards, and pac choi, all of which produce several harvests of beautiful, tasty leaves throughout the year. 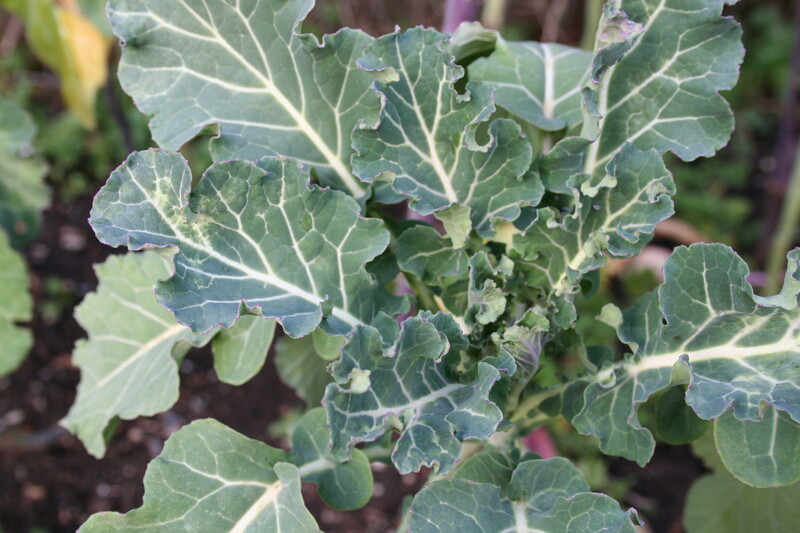 Veteran food bank gardeners at my pea patch have also had good luck with brassicas like cauliflower and broccoli. Thanks for sharing your harvest with those who aren’t as fortunate. For a half-dozen reasons, we got off to a slow start in the food bank beds this year. We cleared cover crop and weeded the beds one rainy weekend back in March, and it all grew back when we didn’t plant in time. Later we seeded beets and chard, but nothing grew. Too cold? Too wet? Who knows. We moved on and planted donated collard seedlings and onion starts; the collards fried on a hot day before they could get a footing. The beds became overrun with weeds again while we sought out a new supply of seed. Finally we planted a single bed of tough-looking brassica seedlings, and they managed to survive. All in all, it’s been pretty frustrating. Nevertheless we’ve managed a few small deliveries this year to the Rainier and Cherry St. food banks, mostly with donations from generous individual gardeners. Yesterday we brought in armloads of herbs pruned out from the patch’s unruly herb garden. “Boy that smells good,” floor manager Mike said, taking the bundles from me. I hadn’t seen him in a long time and wished there was more to give, like last year, when I made deliveries on a near-weekly basis or so it seemed. No matter. Something close to giddiness spread through the food bank kitchen as people buried their noses in stems of mint and bay leaf. “These will be gone as soon as you turn around,” he said. So I gathered my cloth bags and trekked up the hill. The situation: a single plum tree with two varieties of fruit — one small and yellow with a beautiful crimson blush, the other a brilliant purple, with reddish flesh. Fruit was everywhere — tumbling through the bushes, rolling down to the sidewalk, piling up on the mulch. No problem, I thought, I’ll take everything you’ve got. As I gathered my loot, several more plums dropped from the tree and landed dully on the ground. In the end I brought back five pounds, and it hardly made a dent. If you’re in Seattle and you’ll never finish eating the fruit on your tree, please consider having Lettuce Link pick your trees and donate the fruit to local food banks and shelters. They’re interested in unsprayed plums, apples, and pears that aren’t wormy. The upsides for you include a mush-free yard, a tax deduction, and good karma. To arrange a pickup, contact Sadie at sadieb@solid-ground.org or 206.694.6751. They also need volunteers to help pick trees and deliver fruit. Similar fruit-picking programs exist in the Moscow-Pullman area, Portland, Ashland, Berkeley, San Jose, and Vancouver, B.C. It’s the start of the rainy season here in Seattle, and to get in the mood I recently toured the brand new Northwest Harvest warehouse in Kent, Wash. Northwest Harvest is, of course, the hunger relief group that supplies food banks like Cherry Street, where we bring produce from our pea patch. As you’d expect, the warehouse is clean and bright with soaring ceilings. We stopped by the re-packaging area first, where volunteers separate thousands of pounds of fruits and vegetables into individual servings. That day there were huge pallets of d’Anjou pears donated by a grower from Wenatchee, Wash., a mere 150 food miles away. Many of the pears were in reasonable shape, but it was clear that the fruit needed to move soon — a good reminder of how fragile real food is. The pears were also a lesson in how local food does cost less; we learned that nearly all of Northwest Harvest’s fresh produce comes from in-state growers. We looped through the dry goods area, where Top Ramen was piled to the ceiling, then dashed through the sub-zero freezer taking note of frozen turkey and mashed potatoes, bought last year at last year’s prices, because the new warehouse suddenly meant the the organization could store all of it. The amount of space is just phenomenal, 94,000 square feet, and Chris, the warehouse manager, grinned as he related that he no longer has to turn food down when someone calls trying to offload, say, ten truckloads of oats. I was amazed to hear that a hunger relief agency once had to turn down gifts like that — how many people could those truckloads have fed? — just because there was nowhere dry and clean to store them. Last week one of the veteran pea patchers left me ten pounds of rosemary to take to the food bank, to go along with the usual beets and chard I was bringing. Inspired, I cut an armload of mint, which is growing wild all over our community garden, and added it to the haul. I worried that the food bank folks would think I was offloading our weeds, even if small bundles of mint sell for $2 at the farmer’s market. But Mike, down at Cherry Street, was gracious as ever. “They’ll be happy to have these,” he said, and took the bags eagerly. Last weekend I volunteered to work the Northwest Harvest booth at a little benefit dinner for local farmers. It was my first gig for Northwest Harvest, which runs the Cherry Street food bank downtown and distributes staples to food banks across the state. I was all ready to go, my brain ripe with facts and stats crammed from the speaker’s manual. “Things have gotten so much worse,” I said earnestly. “The price of food is rising, gas costs more, food banks are serving more clients with fewer resources.” Faces glazed over. I tried again. “At Cherry Street, we just had our busiest month in forty years.” People raised an eyebrow, asked a couple of questions, picked up a ‘food security’ pamphlet and maybe a pen. Eventually I worked myself into the unfamiliar position of convincing folks that bigger is sometimes better: “For every dollar you donate, we buy four dollars of food.” The organization’s buying power translates into nutritious meals for three people for just 53 cents. Size and scale are part of what enable Full Circle Farm to donate 5000 pounds of fresh produce to Northwest Harvest every month. Full Circle is a 260-acre working organic farm in Carnation and also a distributor for other local organic farmers who can’t afford to be at every farmer’s market. All of which made me feel pretty sheepish when dropping off my one pound of garden lettuces last week. “Pea patch!” yelled out Mike, the floor manager at Cherry Street, when he saw me. “I’ll have more next time,” I promised. So I’m cooking dinner the other night and what’s on the radio but a segment about the rising cost of food. The price of Grade A eggs is up 35% in the last year. Flour costs 37% more. What else is new? Turns out the story was about food banks and their clients. As you might predict, demand is high and there’s a growing supply side problem, since these days surplus corn goes towards ethanol production. This means a crunch on all of the commodity crops that have historically fed the food bank pipeline. Food bank directors describe clients working two or three jobs who still cannot feed themselves, and a decrease in the purchasing power of food stamps, which don’t adjust up to inflation. Then came the refrain: there’s less fresh produce to go around than ever. Last time I volunteered at the food bank the only thing we handed out with any sort of expiration date were one-pound boxes of blueberries. “We don’t get much that’s fresh,” the manager told me. “So this is a real treat.” Half the boxes had moldy berries. After hearing the radio story I went out to the garden. 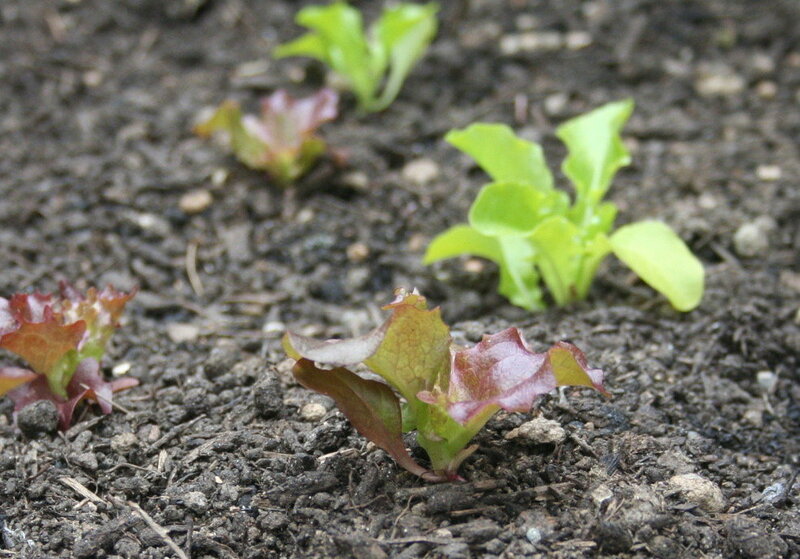 It’s been cold, I said to the lettuces, but it’s time to start growing. Yes, I talk to my plants. Yes, I know a tiny garden can’t change the world. But I really do believe the little extra we share makes a difference. Fresh food is so elemental to human life that it’s at the center of every culture. And still, in this day and age, people go to bed hungry. What better to do on a sunny afternoon than get dirt under the fingernails? I was long overdue for a good romp in the dirt, and the food bank beds were in desperate shape. Some cover crop I’d chopped down weeks earlier was growing back. Curly kale was sending up flower stalks and the mustard was fading. So I turned earth. I pulled up leeks to make way for new crops, dug out the invading spearmint roots, then left the soil to warm in the sun. Over in our private patch (as I now think of it) the overwintered vegetables were delivering a little bit of redemption after a tough winter in which I mainly seemed to be growing material for compost. The collards are now hitting generous dimensions. The garlic greens are fat and still growing. Even stuff that was part of the clean up, like the sandy outer leaves of lettuces and raddichio proved to be edible if not exactly pretty. But no one could tell otherwise in the evening’s pasta of raddichio, white beans, and rosemary. 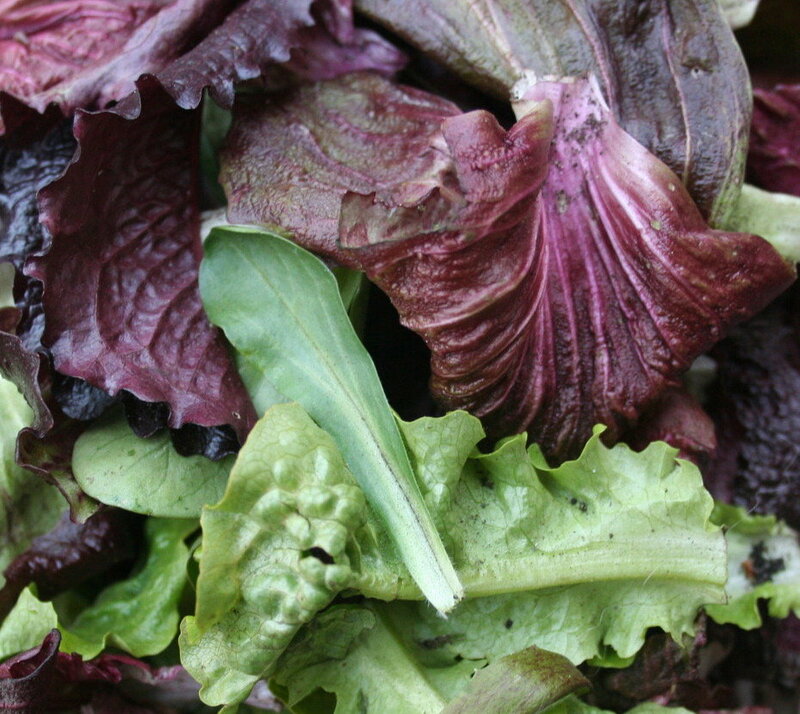 Or with our first garden salad of the spring, this one coming to the table months ahead of last year’s. Garden vegetables in Seattle this time of year are sort of like airplane food — we eat them because they’re the best thing going at the moment. Overwintering never seemed worth it until just now, when I realized we’re still weeks from a steady lettuce and spinach supply and two months from peas, new beets, and carrots. Even if eating home grown vegetables at every meal is a hazy dream of summer days, at least we’ve started eating from our own earth again. That’s a happy thing. 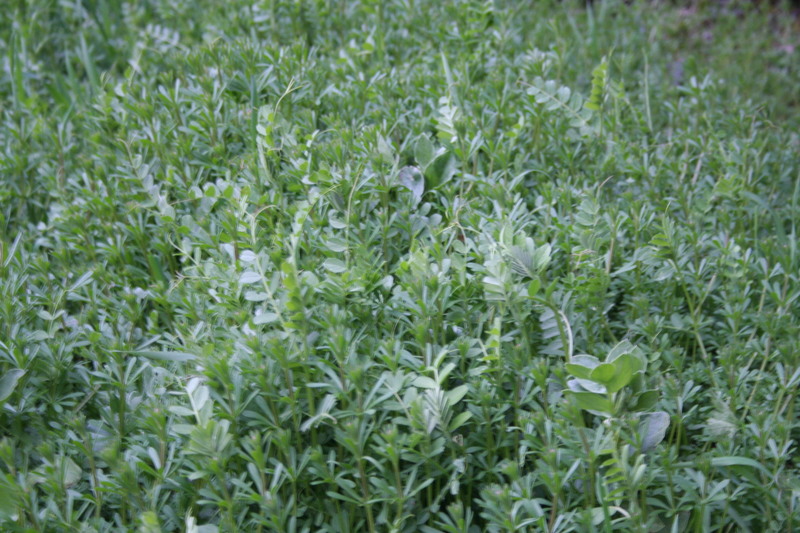 First task of spring in the food bank plots was to cut down the peas and vetch, which meant getting out the machete. I hadn’t handled one before. But once I had the rhythm down – the swing is not unlike that of a tennis forehand – I found I liked the sensation of the blade swishing through cover crop, the occasional stony click of hitting something solid. I was impressed by how dense and massed the crop had become. Next week we’ll pull up the roots and turn it all over, then get ready to plant. It’s a roundabout way of saying that I’m taking over some of the food bank beds this spring. I look forward to the challenge, and not just because there’s something about growing vegetables organically that reverberates deep in the bones. Growing good food for others, for strangers, feels sort of different. As we’re not leaving the city anytime soon, that’s pretty great. A couple weeks ago I volunteered at the food bank and the only vegetables on offer were frozen orange squash and onions, so I know there’s a constant need. Last year our garden delivered hundreds of pounds of spinach, beets, winter greens, and squash, and this year – well, I’ve already been tinkering with the formula in my head. Perhaps some beans to refresh the nitrogen in the soil. Perhaps some broccoli, since it can be eaten raw or with just a brief application of heat. I was impressed by the number of food bank clients who declined the few whole foods available, which included both squash and a bag of dried pinto beans. Some told me they didn’t know what they’d do with the squash, and one said that the expense of cooking pintos, which amounts to an hour and a half’s worth of fuel, was too much. It’s all useful fodder as I begin contemplating the year’s growing strategy.